The 311 Bench Clamp Base Mount clamps to the edge of any work bench or table up to 3 7/16" (87.3mm) thick. Throat depth from center of clamping screw; 2 5/16" (58.7 mm). Four neoprene pads are included and may be used when additional anti-slip characteristics are desired without excessive tightening of the clamping screw. Finger grip handle for added convenience. Three 1/4 -20 screws for mounting Bases are included. 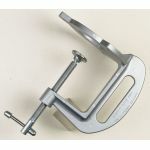 Purchase Panavise Base Mounts and Accessories sold by Howard Electronics Today!